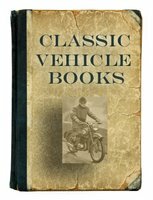 This is a selection of general classic Italian bike books, covering the history and development of the Italian motorcycle industry, Italian makes and models. Guide To Italian Motor Cycles by Cyril Ayton (1985) is a guide to some of the most memorable Italian bikes, from Aermacchi to Vespa, including the great Ducati, Moto Guzzi and MV Agusta. Italian Motorcycles: Classic Sports Bikes by Tim Parker (1984) contains the following chapters: Pesaro - the brothers and de Tomasa - Benelli, Rimini - Blanchi, Morri e TAmburini - Bimota, Varese - Aermacchi, then Harley-Davidson - Caviga, Bologna - Taglioni's desmodromics - Ducati, Mandello del Lario - Carcano's heritage - Guzzi, Breganze - for racing the Dolomite foothills - Laverda, Bologna - the other side of town - Morini, and Verghera - nothing but fire engine red - MV Agusta. Classic Italian Racing Motorcycles by Mick Walker (1991) gives the history of the Italian racing motorcycles. Includes Aermacchi - Benelli - Bianchi - Ducati - Gilera - Guzzi - Mondial - Morbidelli - Morini - MV Agusta - Parilla. Mick Walker's Italian Racing Motorcycles by Mick Walker (1998). This much enlarged and heavily revised edition looks at both major and minor players throughout Italy who have produced racing motorcycles of significant interest. Mick Walker's Italian Classic Gallery: The Racing Bikes by Mick Walker (1991). The renowned authority on Italian two-wheelers presents a unique selection of comprehensively captioned photographs from his collection. An absorbing view of the great post-war classic era of Italian racing motorcycles, packed with action shots, paddock and workshop photos, and phots of riders, mechanics and designers. Italian Motorcycles by Mick Walker (1991) is an expertly written account of the Italian industry and individual machines. In all, more than 300 marques are described and in addtion to the detailed development histories and descriptions of the famous products of such companies as Benelli, Ducati, Gilera, Laverda, Moto Guzzi and MV Augusta, many lesser known machines are also prominently featured.